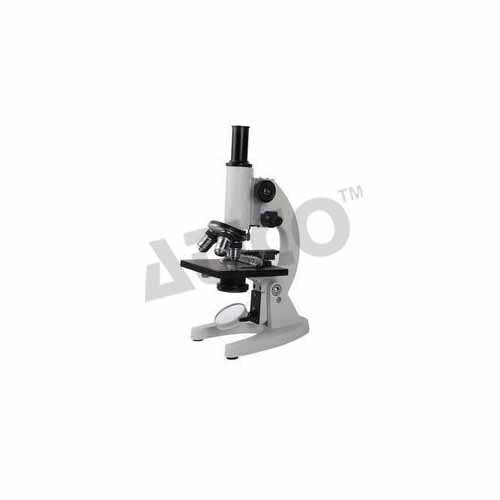 From our wide range of products, Advanced Technocracy Inc. offer optimum quality Student Microscope. Student Microscope offered feature sturdy as well as balanced monocular body that is inclinable to horizontal level at 90 degree and feature mechanical tube length of 160 ± 1 mm and fixed square stage from 120 mm x 120 mm with option of detachable or built-in graduated mechanical stage. These microscopes also feature dust proof triple revolving nose piece that comes with positive click stops as well as illumination through plano concave mirror in fork mount among other choices. 10X & 15X Eye Piece. 10X & 45X objective (Spring loaded), Dust cover & ply box. With lock key arrange men.